They’re just made out of sugar, right? Most people probably don’t give this topic any thought, but if asked are marshmallows vegan, they would assume the answer is yes. 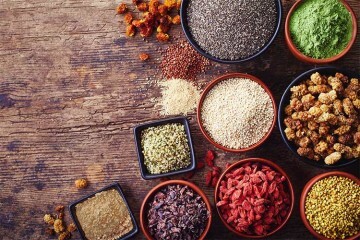 In actuality – up until very recently – this was one of the hardest foods to find in a purely plant-based form. 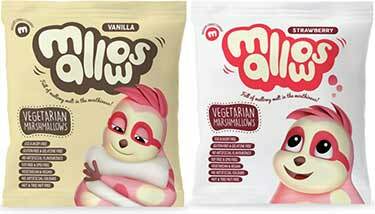 Are marshmallows dairy and gluten free? Almost always. However they are almost never vegan because of the one ingredient which is most commonly used to give them that signature fluffy texture… gelatin. Gelatin is made by taking a number of leftover body parts from cows and pigs, then boiling them down. We’re talking mainly about their connective tissues; the ligaments, tendons, cartilage, and bones. 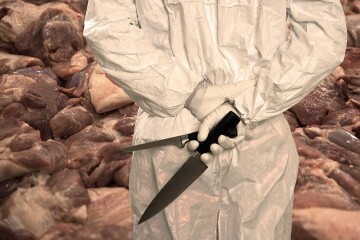 Even for many meat eaters, these things are pretty gross and an alternative is more appetizing. Why we use gelatin is because it’s the cheapest way to obtain the desired texture. 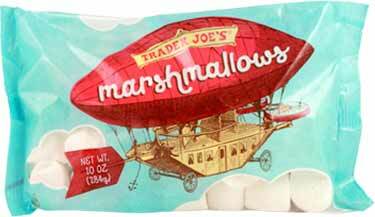 Originally, marshmallows were made entirely from plants. 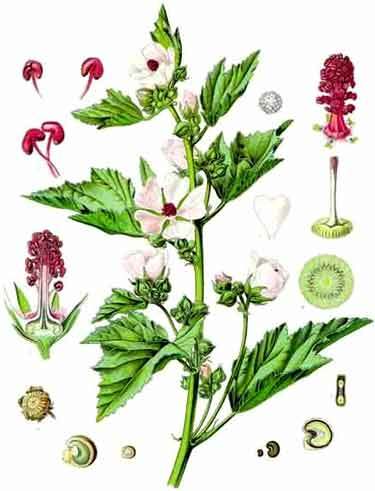 Literally called marsh mallow or common marshmallow plant, Althaea officinalis is a perennial species whose root has been used for millennia to make confections. The Egyptians used it. The Romans prized it as a delicacy. 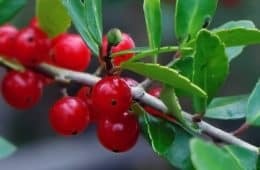 The root would be boiled and combined with other ingredients. Originally, the Middle Eastern snack called halva used this root instead of gelatin to obtain its gummy texture. Long before those little marshmallows ended up in your bowl of Lucky Charms, the French were using the root to make pâte de guimauve, which is basically a gourmet marshmallow made using Althaea officinalis root. 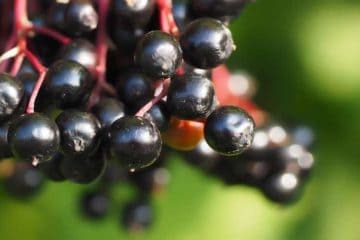 Of course, just like how high fructose corn syrup eventually replaced cane sugar, we also had to replace a more expensive root with a cheap substitute of ground up ligaments and tendons. Yum! Everyone still seems to be far too cheap to use the good stuff – the original root – but in recent years, a number of plant-based versions have came onto the market that don’t have gelatin in them. Here’s our review for the most common brands. These are manufactured by Chicago Vegan Foods, who also make the popular Teese mozzerella cheese alternative (works great in deep dish pizzas). 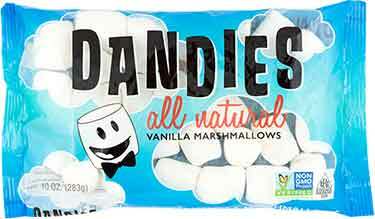 There have been niche and regional vegan marshmallow brands, but Dandies was the first to get nationwide distribution. They’ve been on the market for over a decade now. 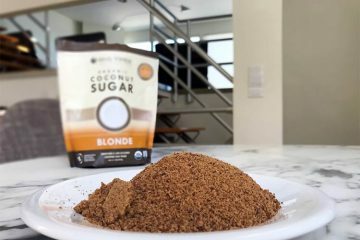 Ingredients: Tapioca Syrup, Cane Sugar, Filtered Water, Tapioca Starch, Carrageenan, Soy Protein, Natural Vanilla Flavor. They taste like a normal marshmallow. They don’t have as much air and fluff as Kraft Jet Puffed, but they do have the same taste. When melted, taste and texture rivals Jet Puffed. Sorry to keep comparing to this brand, but we’re doing that because many would consider it to be the gold standard in terms of what you use for the classic American s’more. Though it does seem to take a little more heat until Dandies will melt into a gooey consistency. 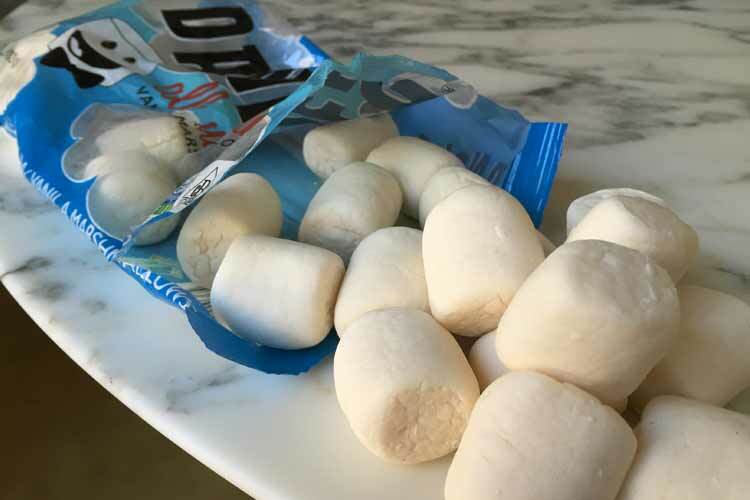 They’re not healthy, but no worse than any other marshmallow. Two pieces contain 20 grams of sugar and are 90 calories. 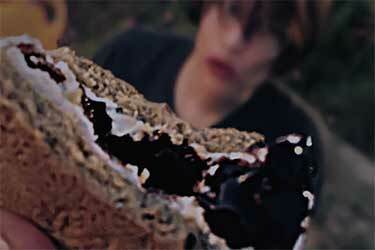 Since they’re smaller than Jet Puffed, you may be using several if you’re making a couple s’mores. 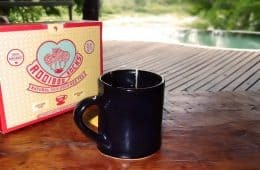 We really wish Dandies would make a reduced sugar version; a combination of less sugar + stevia/monk fruit would be nice. 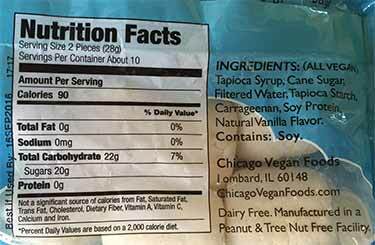 Contains carrageenan. This is a somewhat controversial binding agent. 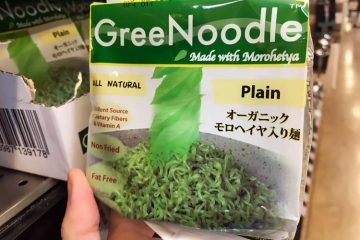 It’s a form of sulfated polysaccharides extracted from seaweed. 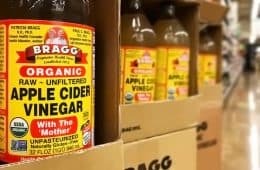 It’s used in all kinds of products and not just vegetarian ones, as you will also find it in Applegate sliced turkey breast, Organic Valley heavy whipping cream, Stonyfield greek yogurt, Kraft cottage cheese, and hundreds of other products. 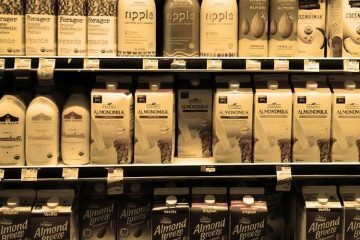 In terms of plant-based products, a lot of almond/soy/flax/hemp milks and ice creams use it, though many are beginning to stop (Califia has phased it out). 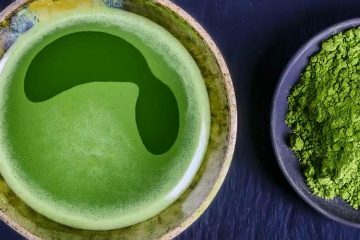 The reason many consider it bad is because it has purportedly been linked to intestinal permeability (leaky gut) and other digestive issues. Buying carrageenan-free milk is a good idea since you may drink it daily, but for something like marshmallows which are a treat that you [hopefully] only eat once in a blue moon, it’s not something we’re very concerned about. Can be expensive, though the price has dropped in recent years. Contains soy, if that’s something you have an allergy to or are trying to avoid. Bag should be smaller, for people like us who can’t control ourselves. 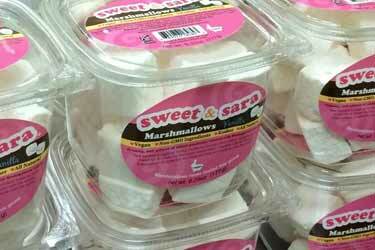 You can find Dandies marshmallows at just about any Whole Foods location. Last we checked, their pricing was $4.99/package (10 ounce) at a Los Angeles area location. However we have seen the price run at $5.99 and $6.99 depending on the store and season. Walmart does not sell Dandies in-store, though you can find them at some supermarkets and most half-way decent health food stores. We usually get them online and buy the 3 pack of Dandies on Amazon. These are new to Trader Joe’s and they’ve carried them for a couple years in a row now. 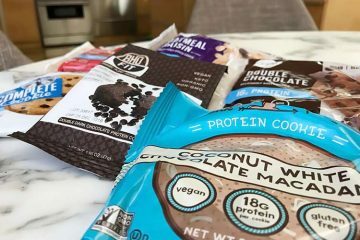 As you see from the photo, their bag doesn’t really play up the plant-based ingredients. 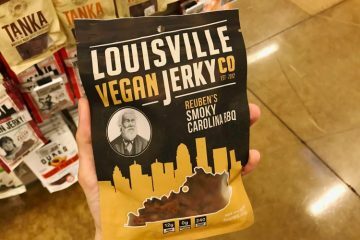 You wouldn’t even know they were vegan unless you read the ingredients and info on the back. Now here’s the interesting part… as you may already know, Trader Joe’s does almost no manufacturing themselves for their private label products. Instead, they buy from others and slap the Trader Joe’s name on the package. Although we have no proof of this suspicion, we would bet that it’s Dandies manufacturing these and they are simply being resold as Trader Joe’s marshmallows. Why do we say that? Because their recipe appears to be the same based on the the ingredient label. Ingredients: Tapioca Syrup, Cane Sugar, Water, Tapioca Starch, Carrageenan, Soy Protein, Natural Vanilla Flavor. When you compare Trader Joe’s versus Dandies, the ingredient list and order of them are identical. Great price. At least for now, the price is $2.99 per bag. Being that it’s also 10 ounces, it’s the same size as Dandies. You can get them cheap. We have a love-hate relationship with Whole Foods. Love that they have some items we can’t get elsewhere, but sometimes aren’t thrilled about their pricing. Trader Joe’s, obviously. 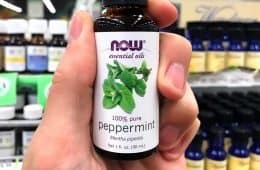 If you don’t live near a Trader Joe’s, you can find people re-selling them on Amazon, though buying them there would be a waste of money because of the markup. If TJ’s isn’t convenient for you, just stick with Dandies. There are other brands on the market, but Dandies and Trader Joe’s are by far the most common. Even in major cities like Los Angeles, we rarely see other options. Previously, Whole Foods carried Sweet & Sara brand (reviewed below) but we haven’t seen them in-store for quite a while now. Throughout the U.S. you will find niche gourmet brands sold in some cities, but nothing else that’s available nationwide in stores. Out of Long Island, this is a bit of a higher-end product. When our local Whole Foods did sell them, we never purchased them because they were charging $9 for a tiny little clamshell and frankly, even if they taste amazing, it was hard to justify spending that much on sugar cubes which are 100% empty calories. It appears Sweet and Sara brand is now trying to make them more affordable by putting them in different packaging and lowering the price point. 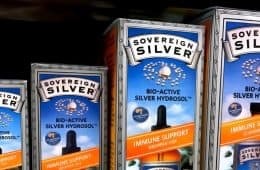 We hear they now retail at $5.99 for a 6.25 oz package. We can’t review how they taste since we have yet to try them. Where to find them? We can’t name a specific store in West LA, but after Dandies, they probably have the widest distribution. All other niche brands are isolated to select markets. Freedom Confectionery is a UK brand. They use vegetarian in the name, but they are also vegan and use no artificial colors. Perhaps the biggest advantage they have over Dandies and Trader Joe’s is that they are soy free, so these may be the only option on the market if you are allergic to soy. They’re also gluten free. In addition to vanilla, they make strawberry flavored marshmallows which we definitely would like to try (if you’ve had them, please review in comments). Their shape is a bit different, too. Even though they’re only sold in the United Kingdom, there are a few sellers on Amazon selling them in or to the US.